Travelling to Europe to take part in the Christmas festivities, and enjoy the beautiful and varied Christmas markets in places such as Vienna, Strasburg, Stuttgart, and Paris, is a wonderful tradition. Whether you go to buy your family unique and gorgeous gifts, or you go to spend some time indulging in a true festive atmosphere, you will find yourself immersed in Yuletide delights – and these, of course, include food (and drink). Because what is Christmas if you can’t enjoy a few extra treats here and there? 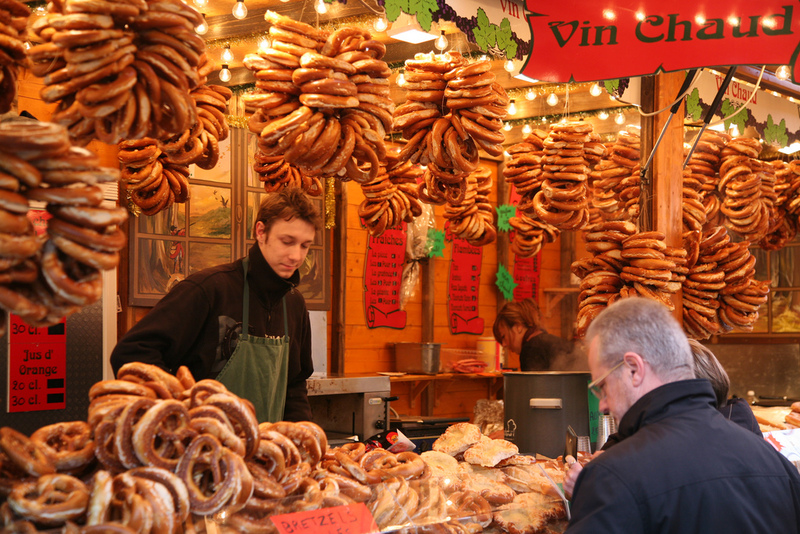 Pretzels, the salty sweet treat made of dough, originated in Europe, so it makes sense that you would be able to find them at the Christmas markets there, and that they would be sensational. Traditionally tied into a knot shape, you can find these delights covered in chocolate, nuts, sugar, and even marshmallows (plus a number of other strange and interesting flavours). They’re easy to eat as you wander around the market. Not just your average hot dog, these are something pretty special. Particularly at German markets (although the idea is spreading across the rest of Europe), the standard hot dog sausage is replace by something a little more substantial, and a lot more tasty – the bratwurst. Made from veal, pork, or beef (depending on the region), these thick, juicy sausages are pan fried in stock and are delicious eaten in a hand baked roll or bun. Try then with sauerkraut for a really authentic German taste! Is there anything more satisfying than being handed a huge portion of chips smothered in your favourite condiment (ketchup, anyone?) with a generous sprinkling of salt on top? Not much! And at the European Christmas markets you’ll find frites (French fries) by the bucketload. Perfect for sharing and ideal for keeping you warm and well fed, the humble chip is the king of foods here. Waffles, with their characteristic pattern and square shape, actually come from the Netherlands rather than Belgium, but wherever they originated, they are now a firm favourite all over Europe. Try them warm with chocolate fudge sauce poured over the top, or with a large spoonful of fruit on the side, and you’ll be fortified for the Christmas shopping ahead. Often to be found roasting nuts over an open fire – although sometimes the barrow is more contained – nut sellers do a roaring trade at European Christmas markets. Chestnuts, almonds, and cashews at the favourites, and a bag of them won’t cost too much either. Munch on sugar, salt, or chilli coated nuts as you enjoy the festive atmosphere, and warm your hands at the same time! Eating is all very well, but you will need something to wash all the goodies down with. That’s where vin chaud comes in. Literally translated as ‘hot wine’, this traditional drink is full of spices and fruit, much like the mulled wine you can find elsewhere at this time of year. It’s the perfect way to warm up and get that Christmas time glow! Plan your next Christmas Markets mini break.